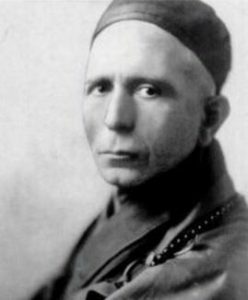 Trebitsch Ignácz (1879-1943) was born in the shtetl of Paks, in Hungary. The family moved to Budapest when he was a child, and after finishing school, he enrolled in an acting academy. By this point, Ignácz had left his Orthodox Jewish roots, and would often get in trouble with the police. At 18, he ventured to London and made friends with Christian missionaries. Ignácz converted two years later and was off to a seminary in Germany where he became a reverend. He was sent on missionary duty to Montreal, but didn’t last very long there, and returned to England. He changed his name to Ignatius Timothy Tribich Lincoln, or I.T.T. Lincoln, and got his British citizenship in 1909. He met the Archbishop of Canterbury (the head of the Church of England) who appointed Lincoln to be a parish priest in Kent. There, he met the millionaire politician Seebohm Rowntree, who made Lincoln his personal secretary. Somehow, Lincoln managed to get on a Liberal Party ticket and was elected to the British Parliament in 1910 in an upset victory over the favoured incumbent. However, MPs were not paid at the time, and Lincoln was soon bankrupt. He moved to Romania and started an oil business. When the business failed, he moved back to London and applied to become a British spy. The British rejected him, so he went to the Germans and was hired as a double agent. Lincoln traveled to the US, but then the Germans didn’t want him either, so he revealed his story to a magazine, and then had a book written about him. The book was popular enough that the British government was embarrassed by the whole thing, and had him extradited for fraud. Lincoln spent three years in prison. After this, he returned to Germany and rose through the ranks of various right-wing parties, at one point even meeting Hitler. Later on, he sold government secrets and was deported for treason. Lincoln now headed to China. After working for a number of Chinese warlords, Lincoln apparently had a revelation and converted to Buddhism. He became a monk and quickly rose to the high rank of abbot by 1931, at which point he founded his own Buddhist monastery under his new name, Chao Kung. In 1937, he became a spy for Japan, but at the same time seemed to assist Japan’s enemy, China. During World War II, Lincoln reconnected with the Nazis and offered to raise Buddhist support for them. When the 13th Dalai Lama passed away, Lincoln proclaimed himself the new Dalai Lama! Despite strong support from the Japanese, the Tibetans rejected his claim. Lincoln passed away in Shanghai not too long after. While some think he was a crazy adventurer who dangerously played both sides of every conflict to even the odds, others think he was a smooth-talking con artist who was simply exploring the limits of his acting abilities – and perhaps even surprised himself at how far he could go. It seems his only redeeming quality came at the end of his life: Lincoln protested the Holocaust and wrote a strongly-worded letter to Hitler to end the terror. Hitler requested that the Japanese have Lincoln poisoned, and this was likely the cause of his sudden death in 1943. This entry was posted in Extraordinary Individuals and tagged Actor, Buddhism, China, Dalai Lama, Double Agent, England, Germany, Holocaust, Hungarian Jews, Japan, Kent, London, Monk, Paks, Romania, Shanghai, Shtetl, spy, Tibet, World War II on September 23, 2016 by Jew of the Week.